Check out the latest Uncorked Box Reviews on My Subscription Addiction! 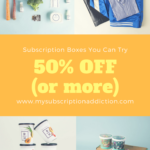 How do subscribers rate Uncorked Box? Do you subscribe to Uncorked Box? Add your rating now! "I canceled after the April box (really should have canceled after March since the only thing I wanted from April..."
"Code WOW125 is not working :( Any other??" "I will use the hair oil, and the thermal spray is at least something different - but if I could go the rest of e..."